When looking at the recipe below, don’t let the long list of ingredients scare you. Read the method and you’ll know what I mean. 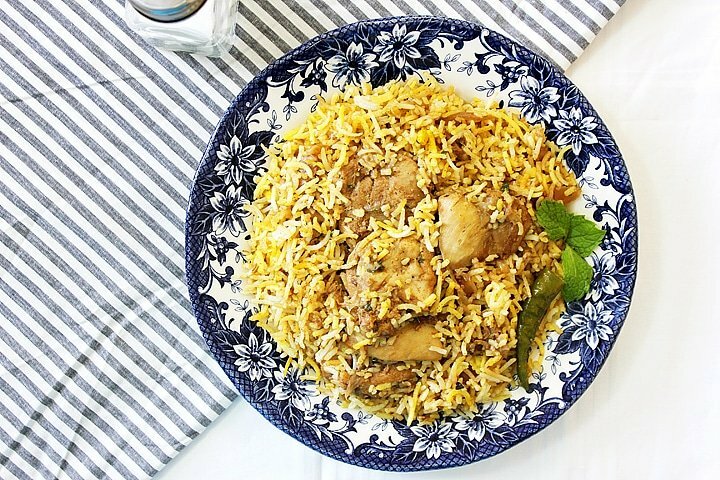 This Chicken Biryani has the authentic taste, amazingly flavorful, and you’ll be done cooking it in no time. 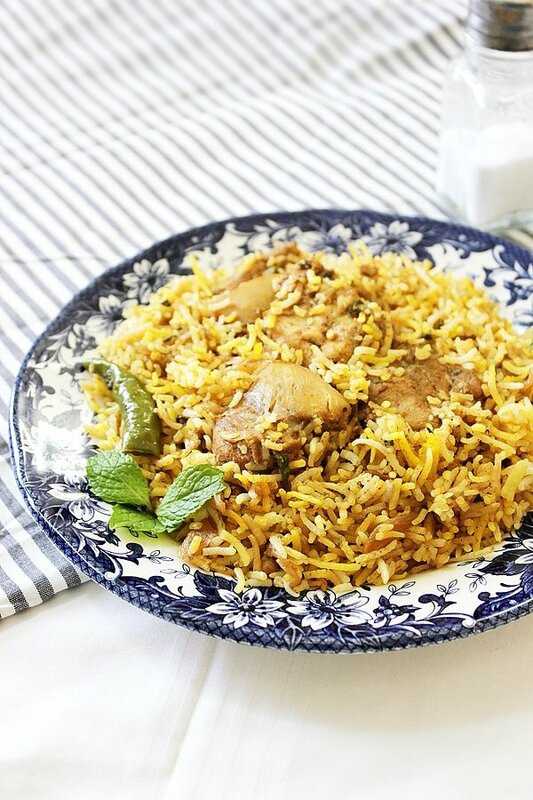 I always wondered if I could reduce the amount of calories in Biryani, since the flavor comes from the Ghee (Clarified butter) and the meat. 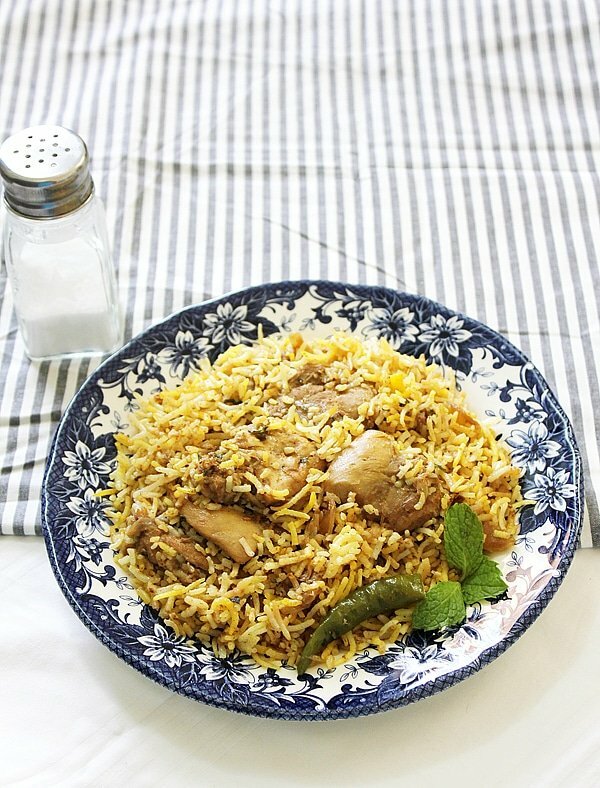 I cooked this Chicken Biryani using olive oil, and it tasted just like the Biryani served in the restaurants. My version will not take much of your time. 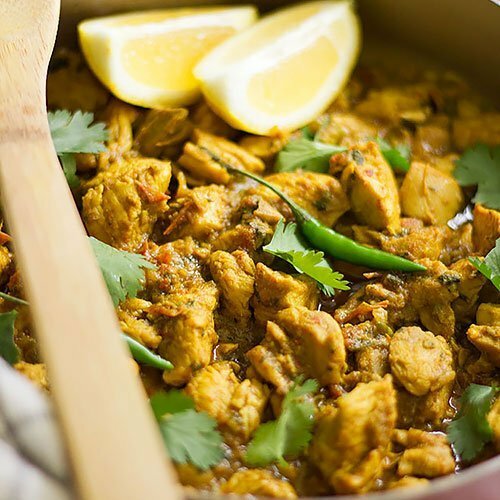 You don’t have to marinate the chicken at all, yet every bite you’ll take will be exploding with flavor. I know that some of you will frown when you see the amount of rice served, but I want you to know that carbohydrates are not your enemy, you need them to stay energized. I’d love for you to try my recipe and let me know how you liked it, and I have to say that this recipe can easily serve four, but I know (from experience) that you’ll want to have more of it. Even after reducing the serving to three, it’s still less than 500 calories. – Mix together and keep aside. – In a small pan, add one-tablespoon olive oil and fry the onion until brown. You can add 1/4 cup water to the onion if you think it is getting dry and might burn, keep cooking the onion until the water evaporates. Keep aside. 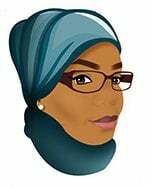 – Ad water to a pan, when it comes to a boil add all the rice spices, stir for few seconds, then add the rice. – When it comes to a boil again, reduce heat to the lowest and cover tightly. Cook for 20 minutes. 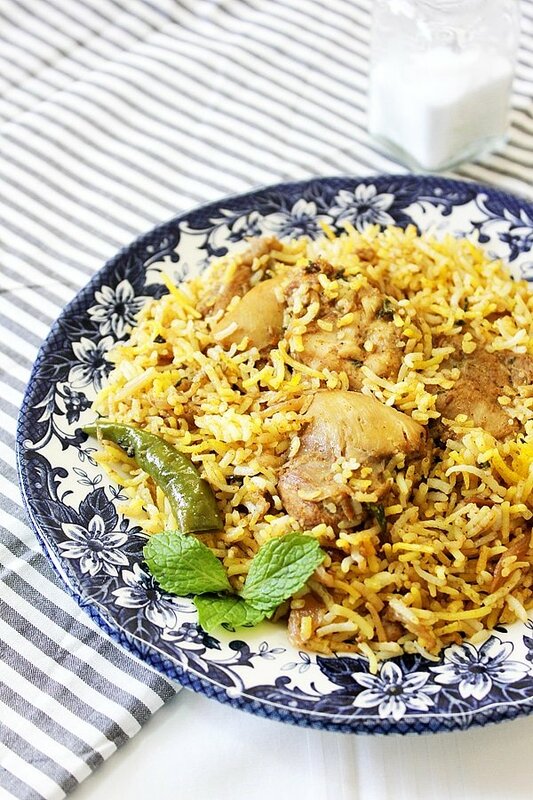 – Pour the saffron mixture on the rice and mix gently using a fork. 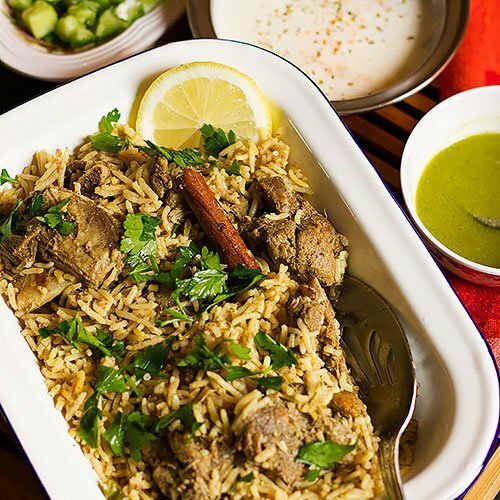 – Add half the rice to a pan, top it with the chicken gravy, then add the rest of the rice. Cover the pan tightly, and let it cook on the lowest heat for five minutes. 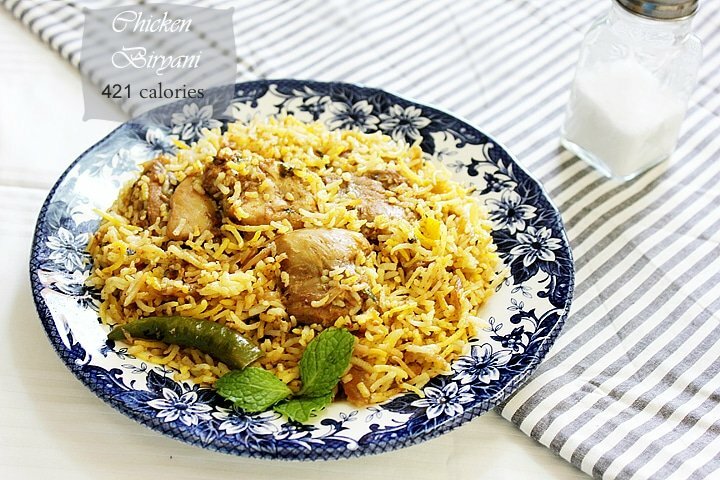 That’s a long list of ingredients…;-) but your biryani looks very delicious! 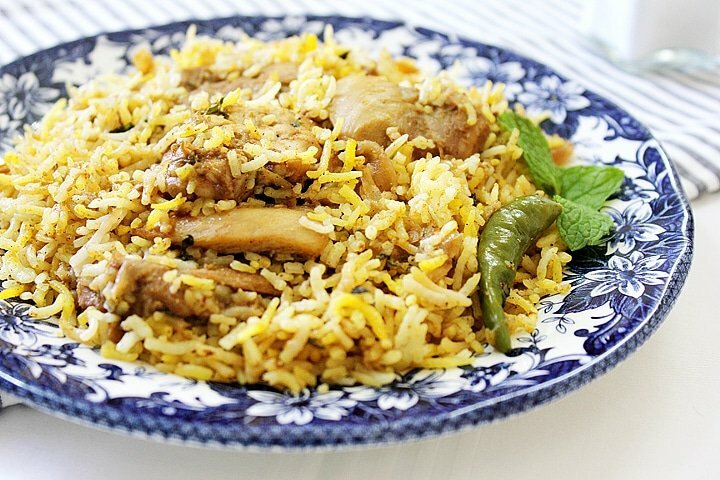 Chicken biryani is one of my favourite comfort dishes. This looks delicious!